It has been quite a fortnight for Formula One's administrators, has it not? First came the announcement that CVC Capital Partners had reached an agreement with SLEC - or most of the sport's controlling entity, in any event - to gain a majority interest in the operation owned 75% by a trio of banks and 25% by Bernie Ecclestone's family's trust, Bambino. Inherent in the deal was the formation of a new vehicle, Alpha Prema. Making up Prema Alpha were the shares of Ecclestone and of Bayerische Landesbank, the latter holding 52.5% of the total; excluded from the deal, according to a release issued by CVC on 25 November, were the shareholdings of Lehman Bros and JP Morgan, each of whom held a sliver under 14% of SLEC. Thus Alpha Prema would hold 72% of SLEC and be managed day-to-day by Ecclestone, whose Bambino trust was expected to make a re-investment in Formula One, whilst Gerhard Gribkowsky, the Bayerische board member who had been chairman of SLEC, too, would, rather inexplicably, be on the board of Alpha Prema. Last week this column ventured that the minorities had little say (or influence) in the take-over, and that they were effectively in a put-up or shut-up situation. In common with the rest of Formula One's media, we were dead wrong in this regard: no sooner had these US banks convened after the Thanksgiving weekend - amid accusations that CVC's announcement had been conveniently timed to coincide with America's national holiday - than they disclosed that they held first-option over any sale of SLEC shares. Their options were, they indicated, potential breakers of the deal. Just how BLB and Ecclestone, plus CVC's analysts could 'overlook' the options of these minority partners remains unexplained, for they alone have had sight of SLEC's articles of incorporation, but come Tuesday CVC Partners announced Alpha Prema had procured JP Morgan's 14%, escalating the holding to 86%. Thus, only Lehman remains outside of Alpha Prema - and, given the rather unhappy circumstances under which the New York-headquartered bank became a minority shareholder in a fundamentally European activity, is expected to sell to Alpha Prema sooner rather than later. If CVC's directors intend maintaining their successful investment records, they need to persuade Formula One's teams that not only will substantially more money be made available to them, but that they, CVC, will ensure greater financial and administrative transparency where it is within their ambit to do so, and lobby on their, the teams', behalf where it is not. Thus, Alpha Prema would need to substantially up the financial inducements to those teams steadfastly aligned with GPMA through direct or indirect links with manufacturers - to wit, BMW, Honda, Mercedes, Renault and Toyota - whilst meeting their demands for greater transparency from the sport's administrators, including the governing body, the FIA. Failing that, we concluded, CVC is sure to find that, like EM.TV, who, in liquidation, sold F1 on to Kirch; like Kirch, who, in liquidation, forfeited F1 to the banks; like BLB and their partner banks, who, in desperation, regularly turned to High Courts in the United Kingdom and Switzerland to clarify their ownership of F1, Formula One is simply a bridge too far. Now, it seems, furious activity has been going on behind closed doors. First came rumours that Alpha Prema intended sharing 60% of Formula One's revenues - whether, though, the figure includes Allsport's revenues, derived from Paddock Club, trackside hoardings and race programme sales, was not specified - substantially up from the 47% of pre-Allsport income, and 23% if revenue generated the Swiss-based concessionaire - believed to be partially owned by Ecclestone - is included in calculations. 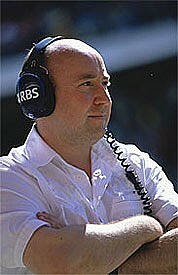 Then came news from Williams that the team had signed up to the as yet undefined, five-year 2008-2012 Concorde Agreement. This was followed, without even a pause for breath, by an FIA announcement of the re-constitution of its International Court of Appeal - the proceedings of which have been a major bone of contention amongst GPMA members, particularly following BAR's post-Imola fate and Indygate. Williams' signing comes as absolutely no surprise. In a mid-October column, written in the wake of a release from the team that an auction of no less than 20 cars in their 'Reserve Collection' were to be publicly auctioned on 14 December, we hazarded a tongue-in-cheek guess that Concorde formalities would be completed before that date. As justification we cited struggling Ferrari: the team signed up for Ecclestone's vision of post-2007 Formula One in January - in return for a large bag of cash, of course - then held a (cash-raising) public auction of cars and kit in May. How long after the auction would it be, this column wondered, before Williams followed suit and signed with Ecclestone. A chastising mail from Williams followed almost immediately, signifying that smoke and fire can go together. And so it has turned out: Williams, next season using leased Cosworth engines and a race driver line-up with but four year's F1 experience between them, announced a week ago that the entire auction had been cancelled after a collector (believed to be US-based) purchased the entire collection. So, less than a week between sale and signing - beating Ferrari's elapsed time by five whole months! Seriously, though, once Williams and BMW parted ways, the team were an anomalous member of GPMA, and the fact that Williams failed to fully commit to the body during their last meeting a month back reinforced the perception. As the sixth spoke on a wheel revolving around a motor manufacturer hub, Williams would always be regarded as a minor member, whereas, within the present structure of Concorde, Williams are second only to Ferrari, and way above the likes of Red Bull Racing and Midland F1. Whatever, Chapple is now urging GPMA to abandon their plans for an alternate championship, which, given that Williams, incidentally (or not) expected to shortly announce a major sponsor, danced closely with GPMA until the recent split with BMW, seems a touch churlish. er all, the others may be holding out on principle whilst awaiting greater transparency, not waiting for 'money'. William's Concorde announcement - and, note that when Ferrari committed to Concorde, the FIA, FOM and Ferrari all issued identical statements; Williams have received no such courtesy from the sport's rulers - included the enigmatic statement "In addition, significant progress had been made in securing important undertakings from the sport's governing body, the FIA, which will underpin the successful long term governance of Formula One". Enigmatic it was then, but less enigmatic it was an hour later, when the FIA announced changes to the modus operandi of the governing body's International Court of Appeal. Of course, the governing body went to great pains to imply that the ICA had long operated totally independently - a point disputed by critics, who point to the ease with which judgments and reversals have in the recent past been handed down. The FIA has pointed out that hearings have been made open to the media, barriers to challenges of ICA decisions in civil courts - where possible under national law - been removed, the number of judges elected to Court increased from 15 to 18, and the appointment of Secretary General made subject to election and not internal appointment. However, if the overhaul of the ICA does not constitute "significant progress (had been) made in securing important undertakings from the sport's governing body, the FIA, which will underpin the successful long term governance of Formula One", what, then, was Williams referring to? Whilst the GPMA attempted to make light of Williams 'defection' to Concorde, stating that, at a meeting on 29 November 2005, the five manufacturers reaffirmed their binding agreement to race together only in a series which satisfies the fundamental principles of a clear and equitable World Championship, this agreement is thought to expire in September 2006 - leaving the way clear for a single, unified championship. Critics of GPMA gleefully suggest that the manufacturer body has been mortally weakened by Williams' move. There is, however, a school of thought which maintains that GPMA has been immeasurably strengthened by recent developments. Its objectives were, after all improved revenue splits, and greater transparency in all dealings, including matters relating to the ICA and the governance of the sport by the FIA. Sir Frank Williams is a wily character, who is, incidentally, the longest serving team principal, having owned a team even before Bernie Ecclestone and Max Mosley did so. He has seen Formula One from all sides now, and would, surely, not have signed the extended Concorde Agreement without assuring himself that the 2008-2012 version was a substantial step forward from the prevailing document, which has significantly weighed down the sport whilst creating enormous wealth for the Ecclestone family. It was, after all, Sir Frank who threatened legal action in 1997, which led to revisions of the present agreement prior to its introduction. True, a sleight of Ecclestone's hand ensured he (and McLaren boss Ron Dennis) did not get their just rewards - presently the subject of litigation between the teams and their then-lawyers - and that, if anything, would suggest Williams had been doubly diligent before signing the latest extension. Would he have, for example, signed the agreement had Ferrari's much-criticized rule-veto been in place? Doubtful. Or, without assurances of long-term rule stability? Even more so. Ditto all major shortcomings in the present agreement. That signifies, above all else, that he is satisfied that major changes have been made (or watertight assurances thereof given) to the sport's revenue sharing, to the transparency of its dealings, and the governance of the sport by the FIA. That being so, GPMA will have achieved its objectives, and well ahead of time, too - leaving the sport to look forward. And, all of us with it.